Urban environments are increasingly filled with digital display systems that are inflexible, flat, bounded, high-resolution, and unresponsive. This installation explores the potential of physically instantiated pixels that enable flexible, reconfigurable, unbounded, low-resolution, and responsive urban displays. Urban Pixels are nodes in a wireless network of physical pixels for urban spaces. Each pixel unit includes a microcontroller, RF transceiver (433 MHz), LED module (ten bright, white LEDs), rechargeable Li-Ion battery pack, IR sensor and renewable energy source such as photo-voltaic cells. Two acrylic half-spheres (4-inch diameter) protect the components from the elements. No additional wiring is needed for communication and the units can be mounted individually to any surface. 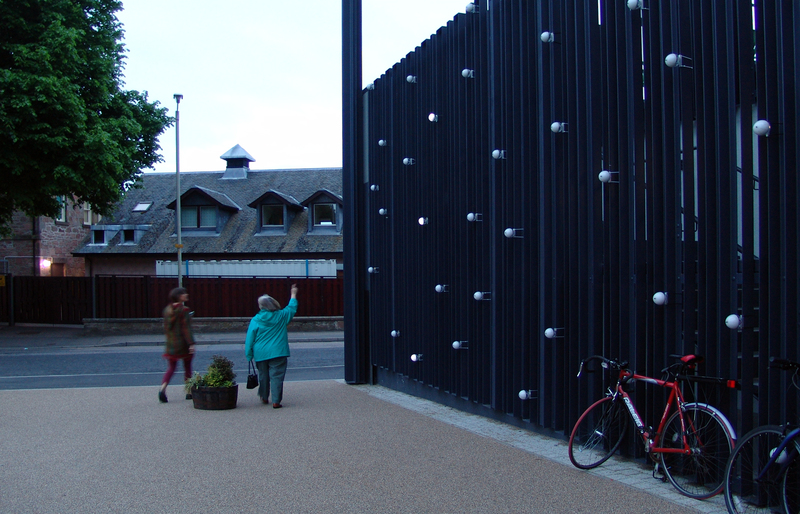 A small-scale prototype network of fifty Urban Pixels was displayed on a façade of Eden Court Theater in Inverness, Scotland from June 1 - June 7, 2008. The public was encouraged to change display patterns via SMS or to interact with individual units via flashlights. We observed and informally interviewed theater guests and passers-by interacting with the façade for several nights. Based on these results, we outline an exciting problem space for designing displays and lighting systems in cities. The installation was reinstalled on the facade of MIT building E15 for one evening in August 2008.